American swimmer Michael Phelps stormed to victory in the Olympic 400m individual medley, and broke his own world record in the process. Phelps led from start to finish to come home in a time of four minutes 03.84 seconds and claim his first of a targeted eight gold medals in Beijing. Laszlo Cseh of Hungary took silver with Ryan Lochte of the United States finishing with the bronze. Phelps' victory was watched by US President George Bush. The 23-year-old swimmer's form looks ominous as he took 1.41 secs off his old mark of 4:05.25. On the medal podium he choked back tears, before a technical glitch brought the US anthem to a premature end, and he laughed and called the other medallists onto the top step with him. 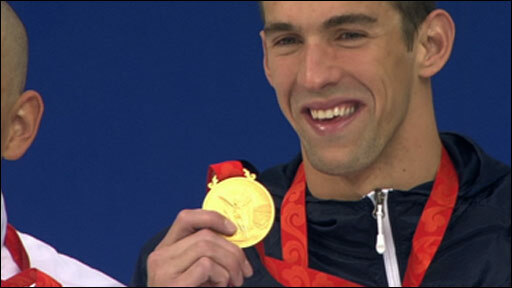 "I'm pretty emotional after that race," said Phelps. "I wanted to go (for the record) but I wasn't sure if I should. But then, in the warm-up room, I kind of got these chills in my body and started getting excited." Phelps won six gold medals in Athens four years ago and is aiming to break Mark Spitz's record of seven golds, achieved at the 1972 Munich Games. He kept on track on Sunday evening local time as he cruised into the semi-finals of the men's 200m. His next attempt for gold comes on Monday when he goes in the 4x100m freestyle relay final at 0423 BST. As well as the 400m individual medley and the 4x100m freestyle relay, Phelps will also compete in the 200m freestyle, 200m butterfly, 4x200m freestyle, 200m individual medley, 100m butterfly ending with the 4x100m medley. Things were close after 200m in the Water Cube, but Phelps soon turned on the style to pull away from Cseh and Lochte to claim gold. "I knew it was going to be a tough race all the way through," he said. "I wasn't really happy to turn and see all three of us together at the 200m point. I wasn't really comfortable with that close a race, I normally have more of a gap. He added: "I made my breaststroke a bit stronger and the freestyle was all downhill. That was pure adrenaline." 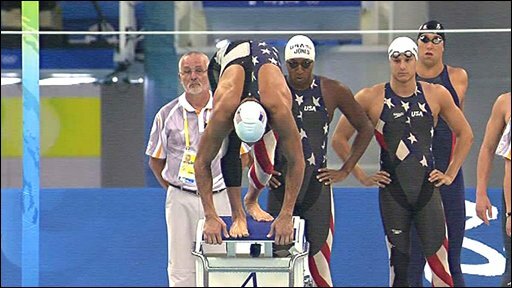 Later on, the United States set a world record in the 4x100m freestyle relay heats. The second-string line-up - Phelps was rested - stormed home in three minutes 12.23 seconds.